The words which hit hardest in a phone review are usually "But there's a problem with battery life". Take, for example, the Nokia N95, arguably the biggest success story of the last year. With every feature (and radio receiver) known to man and with only a 950mAh battery to power it, criticisms of its battery life, often less than a calendar day in real life, were rampant. And justifiably so. Subsequent firmware updates helped a little, but even now using a v20 N95 means that you have to be very careful not to overdo the filming or the GPS or the Wi-Fi surfing. And you had to charge it every single night, without fail, otherwise you were in big trouble. Now, contrast that with its new sister, the N95 8GB. Leaving aside a few other minor differences, the 8GB model is equipped with a (thicker) 1200mAh battery. Now, an extra 26% capacity doesn't sound like it will make that much of a difference, but you'd be surprised. I've been using the N95 8GB as my main device for exactly a month now and I can honestly say that I pay its battery status no attention whatsoever. OK, so the battery life is only 26% more, quantifiably, but it feels like more. And it's enough that I've always got charge left at the end of the day and, quite often, to last through much of the next (if I forget - or am unable - to charge overnight), if I'm careful. In essence, the power to get through a hard day's work marks out a 'battery threshold', if you will. Less than a certain battery capacity (relative to overall functions) and the result will be misery. Greater than the same figure results in happiness and contentment. With this in mind, I thought I'd look at some other S60 devices, to see how well they're bolstered up. The business-oriented Eseries devices are, of course, legends in terms of battery life. The E61, E61i and E90 all have whopping 1500mAh batteries, enough for several days use away from a charger - in the E61's case, with no camera to worry about, users have been known to go a week without charging. Impressive. And waaayyy above my 'threshold'. Back in the rest of the S60 world, the 6290 is another device that uses Nokia's 950mAh battery - but despite being able to do a lot of what the N95 can, the 6290 doesn't have to power a GPS or Wi-Fi or (most draining of all) a 5 megapixel camera and VGA camcorder. The result is that the 6290 sits comfortably above my threshold. As does the 6120 Classic, despite a battery capacity of only 890mAh. On the other hand, the ageing but still impressive N93 struggles to survive on 950mAh. With its main focus being photography and video recording, and with a big, big camera assembly with optical zoom, it's perhaps no wonder that the N93's battery life under typical photo/video conditions is measured in (around 60) minutes rather than hours. Well below the battery threshold and, used as an all-purpose smartphone, a source of discontent. When using it full time on a 2 week holiday, I really struggled to make it through each day. There's simply too much to worry about in life (health, death, taxes, kids, etc.) without having to worry about my smartphone running out of power as well. 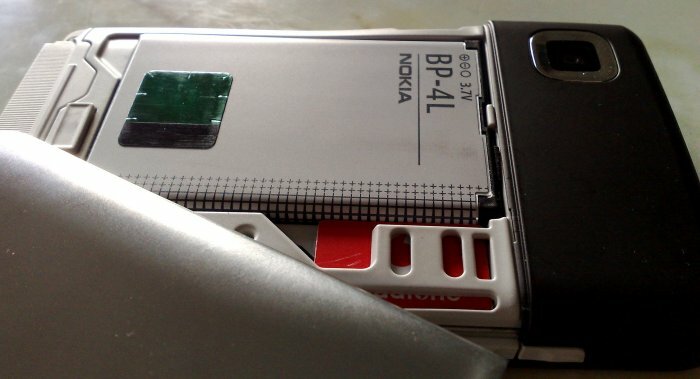 For me, the Nokia N95 8GB, the E90 and the E61i are good tools that I'm happy to use without battery worries, although they're not, of course, the only options. What do you think? Which devices would you say are also comfortably above my stated battery threshold? Do you pay your battery power indicator scant attention? Comments welcome!